John Buoni, a jester in Italian courts who "mis-spent his youth in wild living". After suffering illness, he reformed completely, converted, and became a hermit. His reputation for piety attracted visitors and in order to escape them he left one night and walked, aimlessly, till dawn. To his surprise he found himself at the door of hermitage. 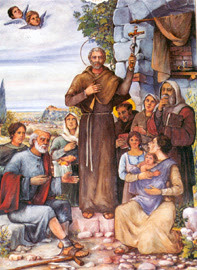 Taking this as a sign, he gained new energy to face his visitors, offering them the Augustinian rule, and forming the basis of Augustinian hermit friars.